I’m Mark Dearnley, HMRC’s Chief Digital and Information Officer. Today we have published HMRC’s Digital Strategy. Be still my beating heart, the strategy is no less than to ..
... the vast majority to deal with us through modern digital services that we’ll offer. You may have wondered. Now you know. And as the light dawned and brought you round from your dreams did it perhaps occur to you, too, that hang on a minute, don't we already have our own on-line tax accounts? Each business has its own on-line VAT account, for example (Value Added Tax/Sales Tax). And its own Corporation Tax account. And each business already submits its VAT returns on-line using the Government Gateway. We have done for years. There's nothing new about it. And nothing new about submitting our CT600 Corporation Tax returns on-line. Not to mention our PAYE returns (Pay As You Earn/Income Tax). And more. It's not just businesses. Individuals, too, have been able for years to submit Self-Assessment tax returns to HMRC on-line. HMRC published its first digital strategy back in 2012. He doesn't mean that, of course. HMRC has had digital strategies for decades. 2012 may or may not be the first time a strategy was published. The Digital Solutions Programme, together with the Government Digital Service [GDS], is developing an Identity Assurance (IDA) capability ... The ID hub ... gives a route for government to utilise existing, trusted identity providers in the market. A pilot IDA service, using point in time verification (a necessary part of the PAYE online exemplar) to make things simple and easy for one-off transactions will be used in October 2013 with wider IDA capabilities becoming available from October 2014. That October 2013 PAYE pilot didn't happen. It couldn't. Because GDS couldn't provide IDA, the identity assurance required. We shall see what "wider IDA capabilities [become] available" this month, a year later, if any. Inexplicably, GDS told the Americans last year that IDA was working. It wasn't. It still isn't. And yet, inexplicably, someone has told Sir Jeremy Heywood, the Cabinet Secretary and head of the home civil service, that it is. But enough of that. What, you want to know, about the new strategy? HMRC's 2014 strategy? At para.8.7, HMRC's digital progress is enumerated in 22 "Actions". And for each Action, there is a "Commitment". Ditto Actions 6 and 7. This is the strategy of the HMRC digital team, headed by Mark Dearnley, Chief Digital and Information Officer. And the question arises, what with all this working closely with GDS – the Government Digital Service, part of the Cabinet Office – and agreeing delivery plans with them, is there any time left to work with HMRC? What do GDS know about collecting the money that pays for the UK's public services? There is no mention of any commitment to HMRC. Only to GDS. 10 times. Who is Mr Dearnley's team working for? By the Lord before whom this sanctuary is holy, I will to [GDS] be true and faithful, and love all which [GDS] loves and shun all which [GDS] shuns, according to the laws of God and the order of the world. Nor will I ever with will or action, through word or deed, do anything which is unpleasing to [GDS], on condition that [GDS] will hold to me as I shall deserve it, and that [GDS] will perform everything as it was in our agreement when I submitted myself to [GDS] and chose [GDS's] will. How many misleading propositions can you smuggle into a single sentence? The money doesn't pay for public services. That's the whole point. We're running an annual £100 billion or so budget deficit which continues to inflate the £50 billion or so annual interest we're spending on our £1,500 billion or so national debt. HMRC's tax collection work depends on their £800 million p.a. ASPIRE contract with Capgemini and Fujitsu. The digital team don't mention ASPIRE in their strategy document. Does the team propose to supplant Capgemini and Fujitsu? If not, what's the point of the team? But if they do see themselves taking over, then how? With assistance from GDS? What assistance from GDS? HMRC and ASPIRE together have a long record of successfully operating digital transactions by the million. GDS don't. Did the villein plight his troth to the wrong Liege? Lord GDS when he should really have chosen Lord HMRC? How digital is central government in the UK? HMRC are party to 72% of all the UK central government transactions GDS have chosen for their universe. No other department reaches even 10% of this volume. 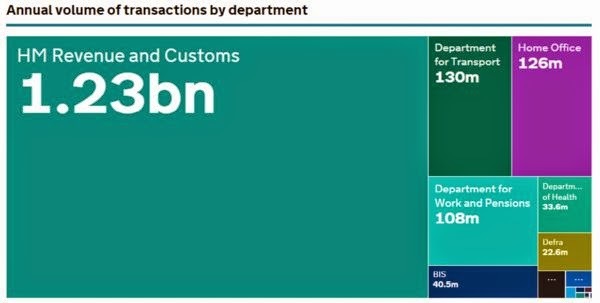 The Cabinet Office, for example, home to GDS, accounts for only 0,28%. HMRC have achieved 92% digital take-up. Weighted by volume of transactions, digital take-up in every other department is tiny. Null hypothesis: "Digital services in UK central government" means HMRC services. HMRC have achieved that position starting before GDS was created in 2011 and without GDS's assistance since then. If anything, it is HMRC who have lessons to teach GDS, and not the other way around. We still don't know how digital central government is in the UK. But we do know who to ask how to achieve digital transformation.